Electra Palace Hotel is in the heart of the old town of Athens and under the shadow of the Acropolis and uniquely combines the aristocratically and traditional architecture of Plaka, with the luxury of the unique facilities and services offered by a five star hotel. Electra Palace Hotel was recently redesigned and has been completely refurbished, expanded and outfit with the most contemporary equipments of the 21st century. The most modern facilities are available at the Electra Palace Hotel because a simply stay will be transformed in a very and unforgettable experience. Electra Athens Hotel, sighted on the Internet as one of the best located hotels in Athens for people how want to visit the Acropolis and the archeological sites as well as those who also want to do shopping or just come to do business. For whatever reason you come to Athens and stay at the Electra Athens Hotel, your stay will be very comfortable – as the hotel has all the amenities and facilities anyone would ask for. 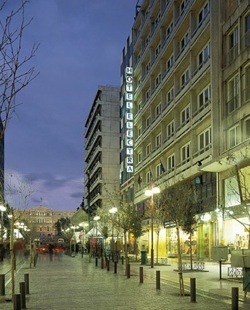 Although Electra Athens Hotel is at the most central position of down town Athens it is on a pedestrian street making it ideal as most visitors quote. and rates on your own.